In looking at some of the recent iPhone (or iPod Touch)-based initiatives in education, I was struck by something: most of the uses described focused on using the iPhone as a client for information consumption and basic feedback, rather than as a tool for creation. While the iPhone is indeed an excellent information client – I prefer to read the New York Times on the iPhone, rather than on my laptop or on paper – this nonetheless struck me as unusual. Was this due to limitations of the device, or of the way it was thought about? In considering this latter point, I noticed that a repeated theme in many discussions of the iPhone in education was that it was “only” good for “notetaking”. This, however, struck me as missing a key point – and one that predates any introduction of computer technology into the classroom. As any serious writer, visual artist, or musician knows, one of their most important professional tools is a good notebook or sketchbook. I know no choreographer or theater director that would take a step outside their home without a way to take notes in hand. And as any scientist would be happy to confirm, the “good bits” and insights of the research process are to be found in lab notebooks. In short, prefacing “notetaking” with “only” completely misses an essential dimension of the creative process: fundamental parts – and in many cases, the bulk – of the act of creation occur as “notetaking”. I therefore set out to see whether the iPhone could function as a “lively sketchbook” – one that could provide a rich set of tools for analysis and creation across a broad range of scenarios throughout K-20 education. After a couple of months of testing multiple apps in combination with each other, I found that this was indeed possible. The question in selecting any given iPhone app is not whether it has all the features of its desktop counterpart – that way lies interface madness. Rather, the question is whether the app is designed in such a way that it functions in notebook/sketchbook-like fashion, with the same grace and ease of use that one might expect from its paper-based counterpart. Evernote (Website/iTunes Store) Notetaking for the briefest of notes, the types of passing thoughts that need to be grabbed before they fade. Jot down something quickly, snap a fast snapshot, record a brief comment or reminder, and ship it off to the cloud. Notes can be retrieved from any computer, and shared with others. Made more valuable by the fact that it interoperates with Awesome Note (see below). Awesome Note (+Todo) (Website/iTunes Store) My workhorse for writing. Can integrate image and text, organize and file notes by projects, and attach simple to-do date tracking to notes. Interoperates with both Evernote and Google Docs – the latter makes it a great tool for collaborative writing. Quickoffice Mobile Office Suite (Website/iTunes Store) Sometimes, you need more structured writing or formatting options than either Evernote or Awesome Note can provide – this where this app comes in. It’s also a good tool for editing docs created by others, provided their formatting isn’t too complex. Also OK for tables and spreadsheets, so long as you don’t need graphs. MyWiki (Website/iTunes Store) When writing is best viewed not as a single document, but rather as a series of interconnected documents, this is the right type of tool. Also doubles as a very nice webpage creator, since it can output its contents as HTML. Unlike other iPhone wiki apps, this one can’t (yet) act as a wiki server – but the interface and functionality are a much better match for the device. WordPress 2 (Website/iTunes Store) Finally, when writing needs to go out to a central location on the web, I’ve found the combination of a WordPress blog with this app works best. The app is very simple – almost minimalistic – but it works quickly and well to publish thoughts to the Internet. Instaviz (Website/iTunes Store) When I’m sketching out the connections between a set of ideas, or diagramming key elements for a project, this is the tool I turn to – in fact, this may well be my all-time favorite iPhone app. It is both an elegant structured diagram creation tool, as well as a fast and effective way to create concept maps. Additional bonus: excellent interop with both the desktop version of the app for further editing, as well as with Box.net for document sharing. ProStats (Website/iTunes Store) Storing and performing quick analyses of data is an essential portion of an analytical notebook, and this app is both fast and elegant. All the key stats functions – and then some – are included. Some of the visualization options are particularly nice – in fact, I wish more desktop statistics apps were as carefully thought out. SpaceTime – Graphing, Calculator, and Mathematics Software (Website/iTunes Store) The symbolic complement to ProStats – this is a true standalone symbolic math app – a mini-Mathematica, if you will. This is far more powerful than any graphing calculator I’ve ever seen, and the interface, while not the best I’ve seen on the iPhone, is also superior to standalone devices. Coupling this with the rest of the apps described here provides a truly powerful toolbox for math and science exploration. AutoStitch Panorama (Website/iTunes Store) The iPhone’s camera doesn’t have the most impressive optics out there – but as has been said many times, the best camera is the one you have with you. One way to work around its limitations is to stitch together multiple photographs, and that is where this app comes in. A single-trick pony – but one that allows image creators to exceed some of the camera’s built-in limitations. Photoshop.com Mobile (Website/iTunes Store) For most photos, only a few touch-up steps are needed or wanted. This app takes care of those steps – basic cropping, exposure corrections, some simple effects and frames – and little else. It’s fast and simple, and gets out of the way of image creation and reuse. Flickr (Website/iTunes Store) If WordPress is the simplest way to share writing online, Flickr is the most effective way to share images. Not only can this app get photos into the cloud – it can also source Creative Commons-licensed images for remix and use in other projects. 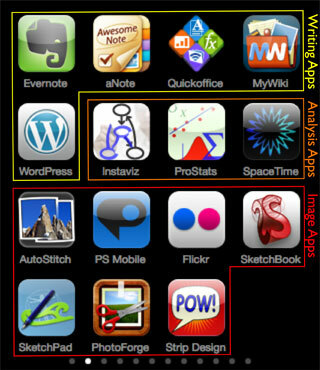 A key app, particularly for use with Strip Designer. SketchBook Mobile (Website/iTunes Store) There are probably dozens of sketching and painting iPhone apps. Most either are too simplistic, or clutter up the interface with awkwardly implemented options. This app, in my view, gets it “just right”: enough tools to have flexibility and power, but with an interface that gets out of the way, and allows you to focus on creating. It “feels” like drawing in a sketchbook with pencils, pens, brushes, and charcoal – I actually prefer this to my desktop tablet. Intaglio SketchPad (Website/iTunes Store) A very powerful vector drawing app – the iPhone feels like a natural tool for handling objects in a drawing. It is every bit as effective in the iPhone domain as its counterpart is on the desktop, and it interoperates reasonably well with the non-vector iPhone apps. PhotoForge (Website/iTunes Store) Photoshop.com Mobile can handle basic image manipulation – this takes care of all the rest. All of the tools, filters, and effects you might want – and then some. The additional tools come with an interface that is not as elegant as it could be, and some added complexity, but it’s worth it. Strip Designer (Website/iTunes Store) It’s always been my view that comics are one of the essential forms of digital storytelling, particularly in education. Strip Designer is an excellent tool for comic creation – a reasonable and usable subset of a desktop app like Comic Life in the palm of your hand. Recorder Pro (Website/iTunes Store) An essential component of an “audio sketchbook” is a recording app that does a clean, competent job of recording the spoken word – and nothing else. This app fills that requirement very nicely, with an interface that gets out of the way of the recording process, and good options for adjusting the quality of the recorded files. NLog Free Synth (Website/iTunes Store) Another key component of the “audio sketchbook”: a simple musical instrument that allows one to “doodle” musical ideas. This is one area where exploring the app store is worthwhile – there are multiple apps that will appeal to different preferences in instruments, whether keyboard, string, or wind. This one is my favorite, though – the keyboard interface is usable without cumbersome or finicky finger picking, and the surprisingly rich sounds are reminiscent of old-style analog synths. MultiTrack – 16 Track Recorder (Website/iTunes Store) Recorder Pro can’t handle the more complex layering involved in a sketchbook for musical or spoken word ideas that involve more than one simultaneous thread. This app fills in very nicely in that category – the interface allows handling a complex set of options simply and transparently, and also makes for a gentle learning curve. Xewton Music Studio (Website/iTunes Store) Just as MultiTrack expands upon and complements Recorder Pro, so this music composition app expands upon and complements the NLog Synth. This is not unlike having a pocket version of GarageBand – but with an interface uniquely suited to the iPhone. This is not limited to doodling – it is perfectly possible to put together a good rough draft of a musical composition using this tool. Storyrobe (Website/iTunes Store) Most of the apps in this group embody progressively more complex approaches to the task of digital storytelling in video. This one is the simplest of all: bring in several still images in sequence, then overlay a spoken narrative that can cross image display boundaries – but is nonetheless effective for all that. Slideshow Builder (Website/iTunes Store) The next level of complexity allows for more complex transitions and relations between the images, setting them to a prerecorded soundtrack. Currently, this app is limited to “live” presentation – it uses its own file format, and unlike Storyrobe, it cannot output a video file – but is very effective at what it does. Storyboard Composer (Website/iTunes Store) Storyboards are essential for both analyzing as well as creating all forms of video or film, but most desktop storyboard apps tend to be either clunky, or very expensive, or both. This app stands out because it is both elegant and reasonably priced, and it is beautifully integrated with the iPhone interface. Not only can it create standard storyboards that follow traditional notation rules – it can also create animations with voiceover based upon these rules. This app is probably the best example of the iPhone as a powerful “lively sketchbook”. ReelDirector (Website/iTunes Store) A workhorse for video editing: this can bring together stills, video captured on the iPhone, voiceover, and recorded audio with all the editing tools and transitions that would be expected for a tool of this nature. As with the Xewton Music Studio in the audio domain, an excellent rough draft of a video project could be produced using this tool. 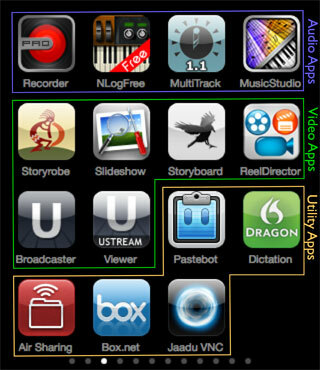 Ustream Live Broadcaster (Website/iTunes Store) If we’re thinking about uses of sketchbook video in education – or anywhere else for that matter – it is important not to forget the domain of live video. Ustream provides a free service and a very nice little free app that allows any iPhone, not just the 3GS, to provide this functionality. Extra bonus: this app can also record video (although at reduced frame rates) on older iPhones. Ustream Viewing Application (Website/iTunes Store) If a student or teacher is broadcasting, then other class participants need to be able to listen in and provide feedback on their own devices. This app closes the loop, with both a video viewer and a realtime chat interface that runs alongside the video stream. Pastebot — Command Copy & Paste (Website/iTunes Store) The iPhone has good basic cut-and-paste functionality – but this little app takes it to a whole new domain by providing both a “multiclipboard” and the capacity to perform some basic processing on text or images shared via that multiclipboard. Extra bonus: a beautiful, elegant interface – it’s not often that you can say that a utility such as this is fun to use. Dragon Dictation (Website/iTunes Store) I find the built-in keyboard system on the iPhone remarkably usable – I won’t win any typing speed contests with it, but overall it works well for the device. That said, there are multiple scenarios where entering text via dictation would work better for a lively sketchbook. Enter this little app, which does a decent job of providing this functionality, provided that you’re connected to the network. How good is the transcription? While dictating text is faster than typing, I find that the necessary corrections bring the overall entry time into the same ballpark as the standard iPhone keyboard. Air Sharing Pro (Website/iTunes Store) When you need to get files to or from the iPhone, this app is a Swiss army knife. It can print to shared printers, connect to FTP, SFTP, and WebDAV servers, as well as to other computers. It is constrained by Apple’s sandbox limitations on which files it can see, which in practical terms means that some file transfers may take an extra couple of steps to route them to an external server via the app that created them. Nonetheless, this remains a very valuable toolkit integration app. Box.net (Website/iTunes Store) While Air Sharing Pro can in theory connect to most commercial file storage services in the cloud, in practice I find that using a dedicated app works better. I like Box.net because it is pre-integrated with one of my workhorse apps, Instaviz. Other apps/services (e.g. Dropbox) also work well for this. Jaadu VNC (Website/iTunes Store) Given the power of the lively sketchbook, what is frequently needed to take a project from extended notes or rough draft to a finished version is only a few minutes on a more powerful computer – and those few minutes need not happen at that computer’s physical keyboard. This app provides remote access to any computer – Mac, Windows, or Linux – that has been appropriately configured. The range of tools that can be reasonably used in this fashion is surprisingly extensive, and well-adapted to the working model I’ve described here.